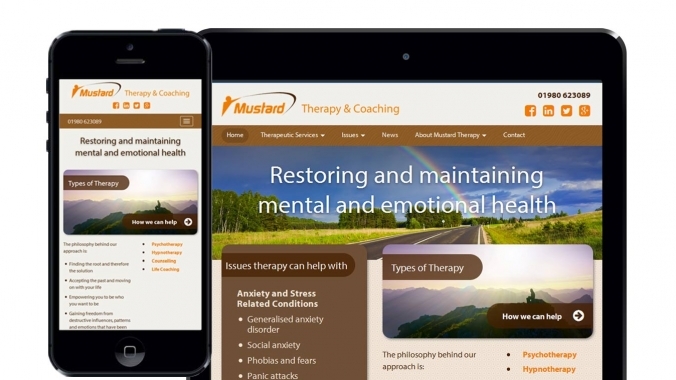 Mustard Therapy is a mental and emotional health practice run by Stewart and Sharon Mustard from their treatment centre in Salisbury. 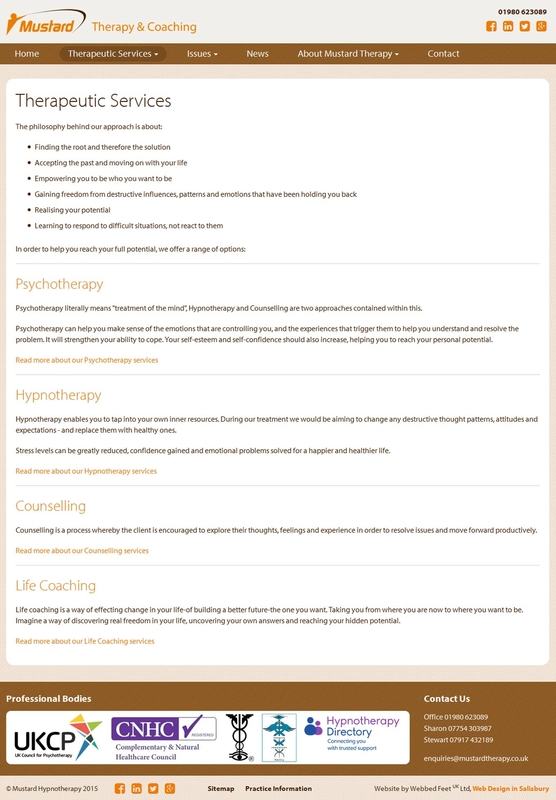 They specialise in psychotherapy, hypnotherapy, counselling and life coaching. Webbed Feet UK built the website from the ground up with a unique, responsive design. The previous website suffered from badly organised content that was focussed around the way that Stewart and Sharon perceived their business, which didn't necessarily match up with what their customers would expect. The website was also lacking a responsive website design, making browsing the site difficult for the growing number of people who primarily use their tablet or smart phone instead of a desktop. Clear organisation of content was paramountTo tackle this issue, we proposed a re-organisation of the web content in to groups of issues that Stewart and Sharon can help with, e.g. anxiety, depression etc. This is more in line with what the audience are looking for. 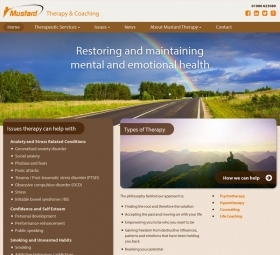 All the issues that Mustard therapy assist with are listed on the home-page so the audience can find what they are looking for straight away. 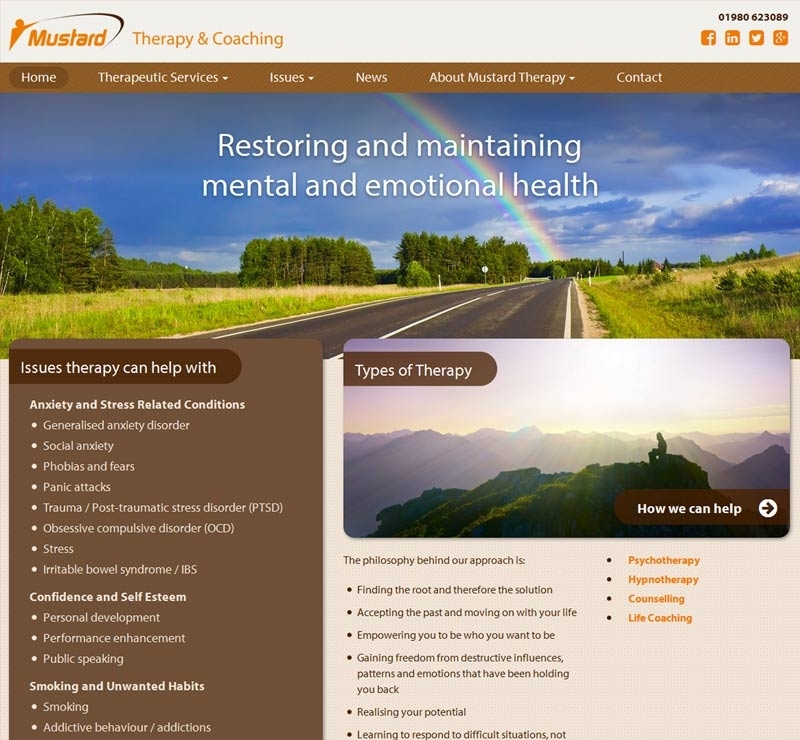 Each issue's web page has a section called 'how we can help'. 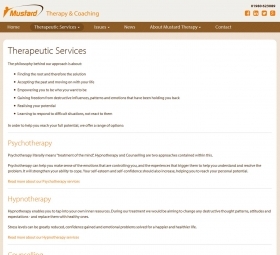 This was added to show the audience how they can benefit from therapy & coaching and is a way of softly selling Mustard Therapy's services. 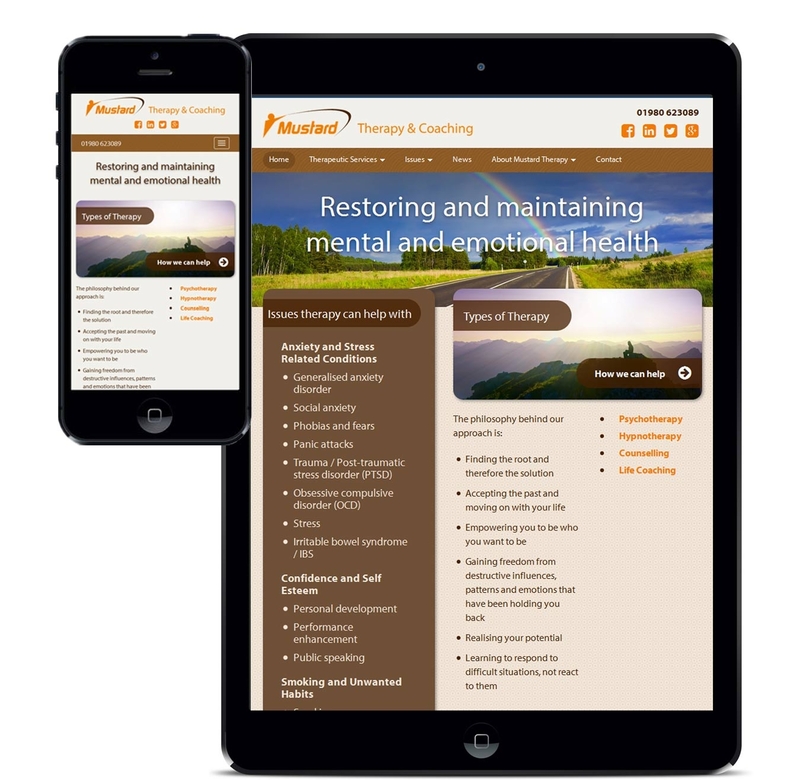 A responsive design was implemented to ensure the website is easy to use for all potential clients, whether they’re browsing on their desktop, tablet or smart phone. An issue that we had to consider was what images to use on the website. Normally, this wouldn’t be a problem, we would simply recommend images that are relevant to page, but with subjects such as depression and unwanted habits, it was decided that we should avoid images of this nature. Instead, we decided to use abstract images that would either give a sense of hope. 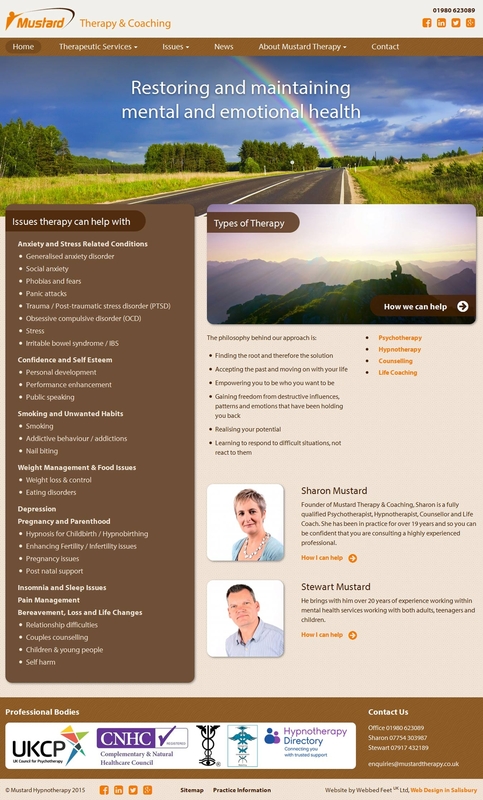 In addition to creating the main website, we also assisted Stewart and Sharon with migrating and consolidating their email from a range of different accounts. We are Webbed FeetUK. 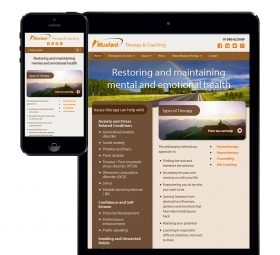 We offer responsive website design in Salisbury. A professional and efficient service. Webbed Feet delivered what they said they would deliver, and so much more. We now have two websites that we are extremely proud to show off! They function exactly as they need to. 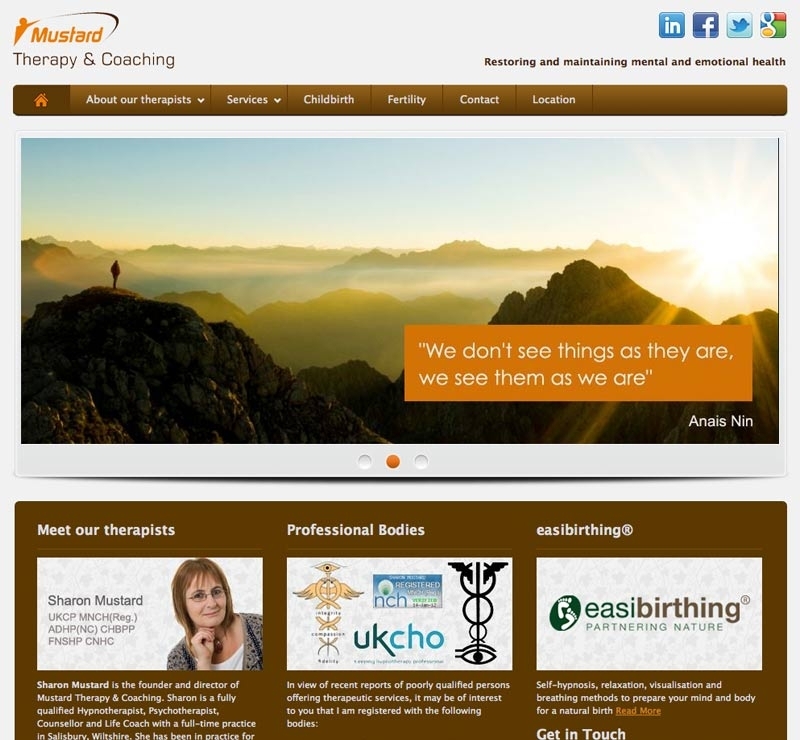 Our practice has expanded in the past year and couldn't have done this without the backing of great web designers. Thank you!